performed by an experienced LASIK surgeon. Using WaveScan technology, we take a “fingerprint” of your eye and your entire visual path that is called a WavePrint map. This detailed information is evaluated by the surgeon. For the Custom procedure this information is transferred to the laser. 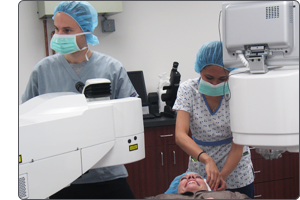 Using the microkeratome with our Basic & Custom LASIK Plans or the IFS Intralase laser with All-Laser Custom LASIK, the surgeon creates a small protective flap that is gently lifted back. The surgeon then uses an excimer laser to apply a cool beam of light, which gently reshapes the cornea allowing images to be more sharply focused by the retina. Finally, the protective flap that was created in Step Two is gently placed back in its original position and begins to heal immediately.